- Gildan Heavy Blend 8.0 Ounce Adult Hooded Sweatshirt. - 8.0 ounce, 50/50 cotton/poly fleece. 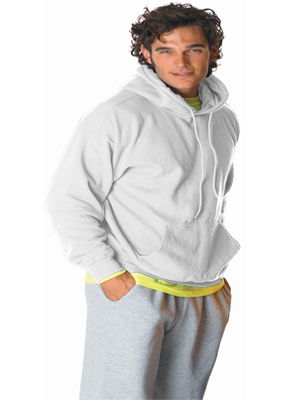 Gildan Heavy Blend 8.0 Ounce Adult Hooded Sweatshirt. 8.0 ounce, 50/50 cotton/poly fleece. Double-lined hood with matching drawstring. Set-in sleeves. Double-needle stitching throughout. 1x1 rib with spandex, pouch pocket. Quarter-turned body. ANSI/ISEA certified as background material for Safety Green. Tear away label. Sizes: S-4XL. Colors: Light Blue. Sizes: S-5XL. Neutral: White. Heathers: Graphite Heather, Heather Sport Dark Green (40/60), Heather Sport Dark Maroon(40/60), Heather Sport Dark Navy(40/60), Heather Sport Scarlet Red(40/60), Heather Sport Royal(40/60), Sport Grey. Colors: Antique Cherry Red, Antique Sapphire, Ash, Azalea, Black, Cardinal Red, Carolina Blue, Charcoal, Cherry Red, Dark Chocolate, Dark Heather, Forest Green, Garnet, Gold, Heliconia, Indigo Blue, Irish Green, Kiwi, Legion Blue, Light Pink, Maroon, Military Green, Mint Green, Navy, Orange, Old Gold, Orchid, Paprika, Plum, Purple, Red, Royal, Safety Green, S. Orange, Safety Pink, Sand, Sapphire, Violet.